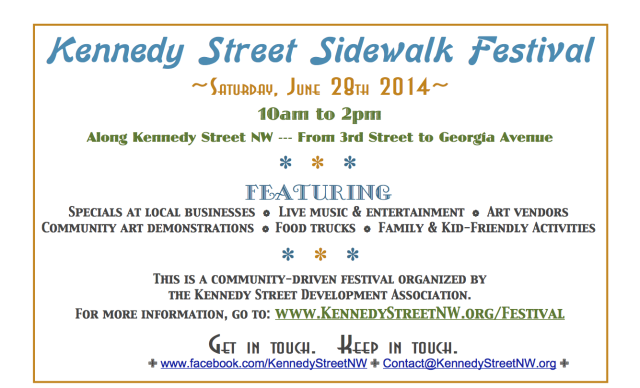 “Come out to the Kennedy Street Sidewalk Festival this Saturday, June 28th! From 10am to 2pm, the street will be alive with music, community-building activities, deals at local businesses and guest vendors – including arts and a few food trucks! The Kennedy Street Oral History Project will be kicking off at the Hattie Holmes Senior Wellness Center (the old theater building), so swing by and share your memories of Kennedy Street. If you have older neighbors who have been here for decades, please encourage them to do the same! All up and down the south side of the 400 and 500 blocks, there will be a range of fun activities for kids. From a community sidewalk chalk mural to face painting to story and craft time, this is Kennedy Street’s most family-friendly day of the year. 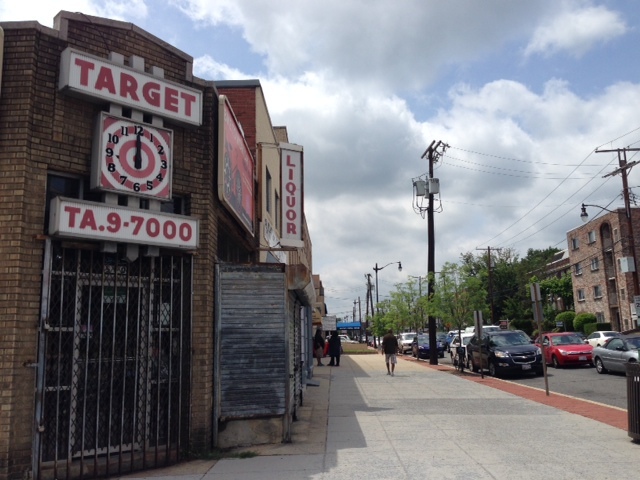 At the corner of 5th and Kennedy, stop in and learn more about the Playable Art DC (www.playableartdc.org) competition that Kennedy Street recently won, and give your feedback on what kind of new art installation should be put in at this site. At the Horton’s Car Wash lot, stop by to shop from our great arts vendors and other local businesses joining us for the day! Have a bike? The Bike House will be hosting a basic bike maintenance clinic at the corner of 7th and Kennedy. Bike on down, tune up, and you can even leave your bike locked to the nearby fence for the day while you check out the rest of the street’s activities. Swing by the New Sewell Music Conservatory on the 700 block, and enjoy the music hub featuring some of the city’s great local jazz and rhythm & blues. Anyone who has been following the saga of the vacant lot at 809/813 Kennedy Street for the last several years should definitely stop by and see the community action going on at that space. And, finally, don’t miss our amazing muralist that’s putting in a great new mural on that big empty wall at the corner of Georgia & Kennedy.